How a Volk Racing TE37 is Made. In short, BUY REAL. If you follow JDMphasis, you know that I believe in saving money and buying authentic parts. There are a number of reasons I believe in doing this. I believe the end result is worth the wait. I believe that a sense of pride in your ride is conjunct in buying authentic parts; as opposed to buying the replicated version. Quite simply, you feel more satisfied, content, and/or gratified about your project when you know you have not cut corners. (Of course, the replica part buyers will argue with this statement, but I stand by it regardless.) I believe in supporting the true innovators and pioneers of the industry - those companies that put the time, research, money, and effort into designing, building, and testing the authentic parts. I believe in quality. On the short list of the most popular Japanese wheels of all time, the Volk Racing TE37 is timeless. Having owned a few sets myself (including the current sets on each of my respective projects), it is easily my favorite wheel. The popularity and enduring, classic nature of this wheel make the design ripe for the leeching replica companies to copy. Something they have not copied (and will not copy), however, is the construction process. I recently came across a great article in Super Street detailing the process by which the iconic Volk Racing TE37 wheel is made. The article is most definitely worth a read. It sums up all the reasons that the authentic is far superior to any replica on the market. …Japanese Samurai swords and Space Shuttle parts are typically forged from aluminum. Ice cream scoopers and yard tools are often cast. Because this post is lacking photographic content, I will throw in a few shots of my TE37 wheels, past and present. I am quite happy with the FJ's new stance and aggressive demeanor. As I stated in my last update post, I would like to do a few more things to the truck, mainly a rear bumper as, in my mind, the truck looks "unbalanced," so to speak, with an aggressive aluminum front bumper and the factory plastic rear bumper. So, I believe that is my next modification to this vehicle. I will not even attempt to put a timeframe on that stage of the project, as it could end up being next week or six months from now. Who knows? Anyway, I have done a couple things to the truck since my last update. Namely, the exhaust and an interior addition that required significantly more work than, I believe, the modification is worth. I came home from work one day this week and found the package from Springtail Solutions. I had ordered their Straddle Combo package. It is basically a bracket that mounts over the center console. To this bracket, there are a couple small "saddle" bags that mount on each side to provide additional storage. I was pretty excited to install this, as it is a functional modification that is actually useful. I did not expect the headache that ensued as I did the install over the course of the next two days. Prior to this install, my iPod would rest in the 4WD shift boot. Now, I have it in the passenger side bag along with the phone charging cord. (I think I should try to track down some black cords.) As I mentioned above, this is a convenient storage solution for the FJ. However, I think if I were to do this again, I would not necessarily follow the provided instructions. I would develop my own mounting method, which would, no question, be easier and less infuriating. That said, I do really like this modification. Now, another issue arose with the exhaust. I had ordered the stainless steel version of the MBRP system and the distributor shipped the aluminum version. Not the end of the world, I suppose. We decided to install it and I was refunded a few bucks for the cost difference of the stainless over the aluminum. I am not too concerned with the appearance of the aluminum system, as you can barely see the tip. The rest of the system is tucked up close to the chassis. I am also debating applying some high-temperature black paint to it now, as well. The note is perfect. It is not obnoxiously loud, but loud enough to know that it is not the OEM exhaust system. It growls nicely when that gas pedal is mashed. So, although I did not receive the exact product I ordered, I am happy with the exhaust. Now, I need to force myself to focus some attention on Project Z33. Project FJ: Stage One Completed. Brian at Pro-Spec facilitated receipt of the FJ this past Friday before the holiday weekend. I am very happy with the final product. I have used every excuse to get out and drive it this weekend and I am left smiling each time. The truck is not nearly as sluggish as I had anticipated and prepared myself for and there is no rubbing with the unproven/untested tire size selection. Thus, the risk and labored research and contemplation paid off, as the final look is exactly what I had hoped for. My only "complaint," if it can even be referred to as such, is that it appears as though the front sits slightly higher than the rear. I am not making any hasty decisions as of yet, because I do anticipated some suspension settling over the next few days. 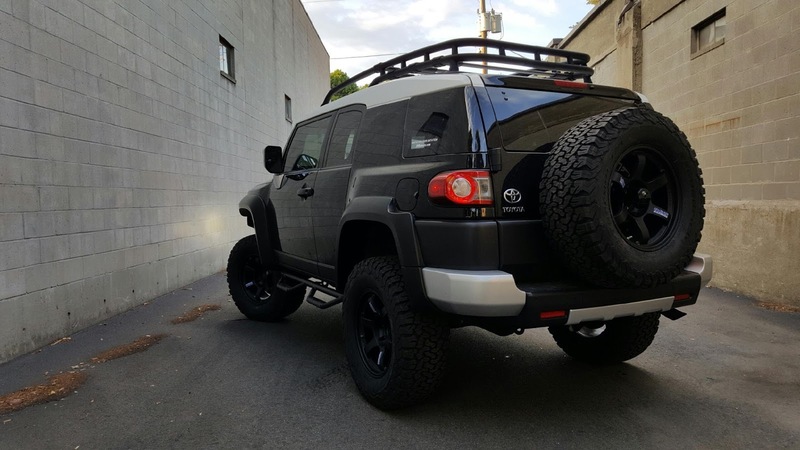 However, I may end up remedying the situation with a small spacer for the rear, especially because my future plans for the truck entail a heavier rear bumper. Volk TE37 Large PCD Wheels (18x8") w/ matching spare. The MBRP exhaust system was supposed to be installed in this stage, but it was backordered across the country from the manufacturer, so it should be arriving this week. That is one thing I noticed - with the more aggressive look, it needs a more aggressive growl. I am really looking forward to having this installed. I have not had a chance to take many good pictures of the truck, but I will post what I have. The mod bug has certainly hit in regards to Project FJ. I can honestly say that this truck ranks as the favorite daily driven vehicle I have ever owned. Some of my future plans for this truck include, as mentioned above, possibly adding a small spacer to the rear suspension, as well as a rear bumper - I am thinking Warrior at the moment. I would also like to do a light bar across the roof rack - both front and back. Also, one of the things I notice when I now look at the truck is the side mirrors. I feel like I need to black them out to match the rest of the truck. Performance-wise, I think the truck could benefit from a cold air intake system. There are a few other smaller things I would like to do, as well, but I would really like to concentrate some attention on the Z at this point. We will see if that happens… Stay tuned. Is 'good enough' an acceptable standard? I have seen much discussion lately about replica wheels. As has been expressed on this subject matter before (and on JDMphasis before), the debate over authentic and replica wheels is one that will not soon be resolved, or satisfied. However, a lot of misinformation is spread haphazardly on the internet and I believe this, like replica wheels, can be dangerous. I recently came across a thread on a forum in which the thread starter has endeavored to “test,” and I use that term with extremely cautious regard, the structural integrity of replica wheels and see if they are, in fact, deserving of their “bad rap.” The “tests” being conducted by this gentleman consist of mounting them on his vehicle and driving them on the same roads on which he drove his authentic wheels, assuring that his “driving style” will remain constant. 5) Analyze the Data and Draw a Conclusion. 1) Are replica wheels more dangerous than authentic wheels? 2) I do not believe that replica wheels are any more dangerous than overpriced authentic wheels. 3) I predict that replica wheels can endure the same abuse as authentic wheels and suffer the same or less damage. 4) I will drive my car, with the replica wheels, in the same manner and on the same roads that I drove the car with my authentic wheels, exposing them to the same potholes and road imperfections. Now, I should note that I have pared down the thread’s content. This particular forum member’s posts are very wordy. I often have trouble following his stream of consciousness posting. He has also mentioned “performance” as it relates to replica wheels and authentic wheels and has suggested that there is not much difference in results between driving with the two different wheels, as it pertains to his “driving style.” I am not even going to attempt to address this portion of his assertion, as I believe it is not worthy of argument. Without getting into forged versus cast or weight and unsprung weight and whatnot, there is significant scientific data to conclude that there is no discussion to be had here. Forged, lightweight wheels are stronger and, thus, perform better – end of story. My biggest issue with this “test” is the most important part of any test – the experimentation. There are way too many variables in this ridiculous test. In an experiment there is to be an INDEPENDENT variable, a DEPENDENT variable, and CONTROLLED variables. The independent variable is the aspect that you intentionally change. In this case, the wheels. The dependent variable is the difference in the two parts of the experiment when the independent variable is changed. So, here, it would be the reaction of the wheel to the same testing. The controlled variables are the variables of the experiment that remain the same. For instance, and this is where this “testing” fails miserably, nothing in this experiment is constant. There are no constants. Tires are not the same. Wheels specifications are not the same. Driving manner is not the same, as much as the thread creator wants to say his “driving style” has remained constant throughout. The road conditions are not the same. The roads themselves are far too vast and unpredictable to draw any accurate, real conclusions. 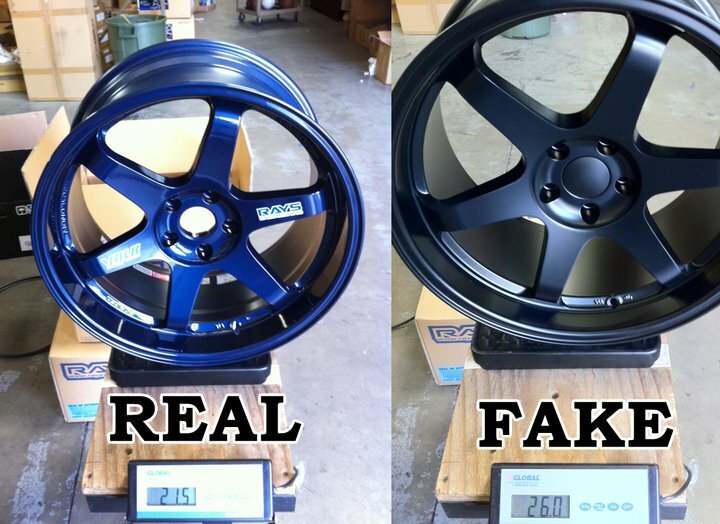 In many ways, the fact that I am even commenting on this “test” of replica versus authentic wheels is absurd. Any layperson can see that this is not a reputable, trustworthy, creditable, or reliable test at all. Testing should be done with sophisticated machinery, mechanisms, and equipment. Every single aspect of the experiment should remain the same for each test – the only thing that should change is the wheel – conduct all the tests with the real wheel and the exact same tests with the replica wheel. This way real data and facts can be obtained, not opinion, bias, and external influence. The thing that surprises (and terrifies) me the most with this forum thread is how many members are praising these efforts and this “test.” It is, indeed, scary to believe that there are many, many people reading threads such as this one giving credence to and relying upon the conclusion of the person behind that keyboard when it comes time to make a purchase. The number of “I know a guy who has driven 500,000 miles on his replica wheels in his 900hp [insert car] and never had a problem” or “Well, I am not tracking my car, so replica wheels are good enough for me,” comments is nauseating. For all we know, the OP of that thread could drive a million miles on his replica wheels and never experience any sort of damage or destruction. That does not mean that we can draw the general conclusion that replica wheels are just as safe as authentic wheels. That is lunacy. Not every replica wheel that hits a pothole will shatter into a thousand pieces. But to suggest that it can or will never happen is also extreme. Not every person who rocks replica wheels is going to die in bloody carnage after a wheel failure. On the same token, not every authentic wheel is impervious to damage. Yes, every individual is entitled to an opinion. If that opinion is that replica wheels are just as safe as authentic wheels and that one would recommend replica wheels for purchase, I urge those people taking this into consideration to remember that this is not based on anything more than an opinion. Opinions are based upon any number of things, the least of which may (or may not) be fact-based data. My opinion? Of course, as always, my recommendation is to save your pennies for a bit longer and buy real. If for no other reason, than because you are not rewarding the undermining parasites of the replica world. If that is not reason enough, then I would suggest that you consider the source of your information when you are making a decision on whether to buy real or fake wheels. There is an abundance of information on the internet – some reliable and accurate, some, like this “test,” absurd, false, and fabricated. 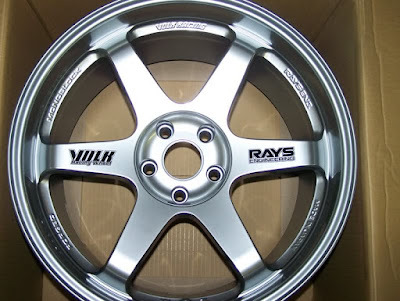 Weds Wheels is a crusader for their brand, as they have been ripped off many times by replica wheel companies. Here is a video of some actual tests they did a few years back.